Here’s an idea for a PhD candidate out there with some interest in government or HR and some quant skills. Imagine you could access the a sensible slice of the HR history of a 300,000+ person organization, so you could see when people were promoted and where they moved in the organization?. 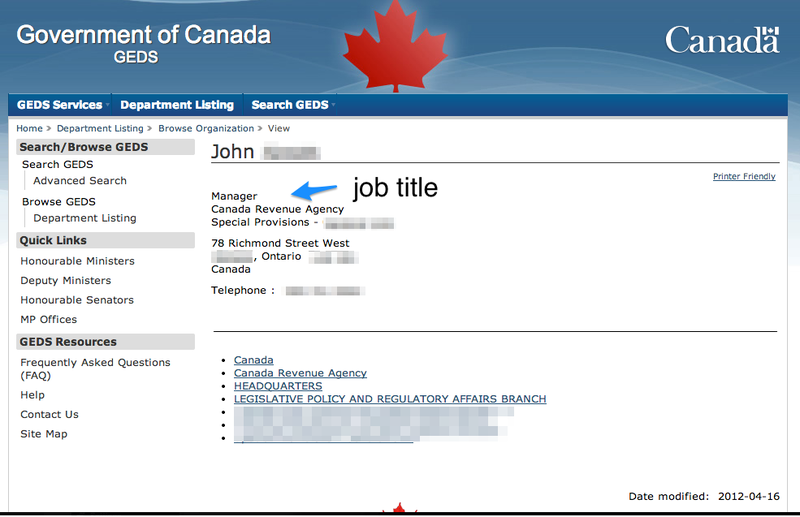 I’m not sure if would work, but the Government Electronic Directory Service (GEDS), essentially a “white pages” of Canada’s national government, could prove to be such a dataset. The service is actually designed to let people find one another within government. However, this also means it could potentially allow an someone to track the progress of public servants careers since you can see the different titles an employee enjoys each time they change jobs (and thus get a new title and phone number in GEDS). While not a perfect match, job titles generally map up to pay scales and promotions, likely making it not a prefect, but likely still a good, metric for career trajectory. The screen shot below is for a random name I tried. I’ve attempted to preserve the privacy of the employee, which, in truth isn’t really necessary, since anyone can access GEDS and so the data isn’t actually private to begin with. There are a number of interesting questions I could imagine an engaged researcher could ask with such data. For example, where are the glass ceilings: are there particular senior roles that seem harder for women to get promoted into? Who are the super mentors: is there a manager whose former charges always seem to go on to lofty careers? Are there power cliques: are there super public servants around whom others cluster and whose promotions or career moves are linked? Are there career paths that are more optimal, or suboptimal? Or worse is ones path predetermined early on by where and in what role one enters the public service? And (frighteningly), could you create a predictive algorithm that allowed one to accurately forecast who might be promoted. These types of questions could be enormously illuminating and shed an important light on how the public service works. Indeed, this data set would not only be important to issues of equity and fairness within the public service, but also around training and education. In many ways, I wish the public service itself would look at this data to learn about itself. Of course, given that there is not effectively a pan-government HR group (that I’m aware of) it is unlikely that anyone is thinking about the GEDS data in a pan-government and longitudinal way (more likely there are HR groups organized by ministry that just focus on their ministry’s employees). All this, in my mind, would make this research in an academic institution all the more important. I’m sure there are probably fears that would drive opposition to this. Privacy is an obvious one (this is why I’m saying an academic, or the government itself, should do this). Another might be lawsuits. Suppose such a study did discover institutional sexism? Or that some other group of people were disproportionally passed over for roles in a way that suggested unfair treatment. If this hypothetical study were able to quantify this discrimination in a new way, could it then be used to support lawsuits? I’ve no idea. Nor do I think I care. I’d rather have a government that was leveraging its valuable talent in the most equitable and effective way then one that stayed blind to understanding itself in order to avoid a possible lawsuit. The big if of course, is whether snapshots of the GEDS database have been saved over the years, either on purpose or inadvertently (backups?). It is also possible that some geek somewhere has been scrapping GEDS on a nightly, weekly or monthly basis. The second big if is, would anyone be willing to hand the data over? I’d like to think that the answer would be yes, particularly for an academic whose proposal had been successfully vetted by an Institutional Review Board. If anyone ever decides to pursue this, I’d be happy to talk to you more about ideas I have. Also, I suspect there may be other levels of government that similar applications. Maybe this would work easier on a smaller scale. This entry was posted in open data, public service sector renewal, technology on September 13, 2013 by David Eaves.